BRITAIN: Cops Get Engaged At London Pride - Joe.My.God. Two police officers made the most out of the Pride 2016 celebrations with a very public proposal. One officer held up the entire parade to propose to his other half, who he knew would be at the front to cheer him on as he passed. 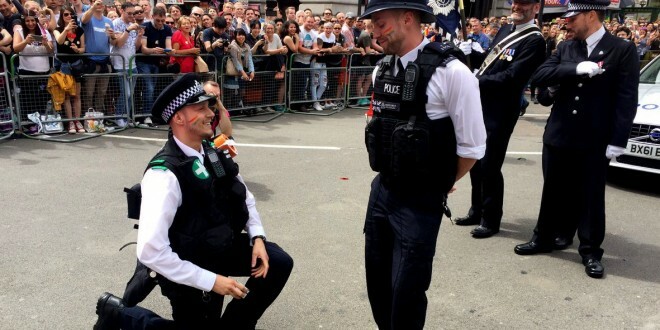 The Metropolitan Police LGBT Network shared two pictures of two officers popping the question during the festivities – one to a fellow officer who was working the same shift as him. The happy couples proudly posed for pictures after and by the end of the day, there won’t be a dry eye in the house. RELATED: As you’ll see in the video below, London’s newly-elected Muslim mayor had a great time at the parade.